Grabilla is simple and fast screenshot capture application. You can grab screenshots or record desktop actions video with voice comments and instantly upload it to our image hosting server - then share your special link! 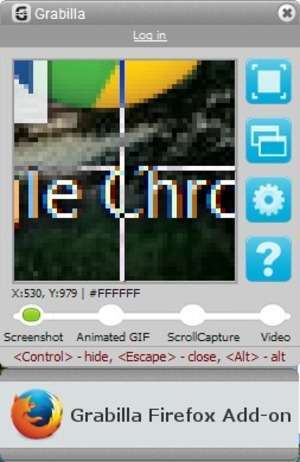 With Grabzilla, you can capture animated gifs up to 10 seconds. You can upload images, videos and files directly to our site. Version 1.25.0.0 is a freeware program which does not have restrictions and it's free so it doesn't cost anything. For security reasons, you should also check out the Grabilla download at LO4D.com which includes virus and malware tests. Additional screenshots of this application download may be available, too.